Rated 5 out of 5 by cg47 from This Game Got Me Started in Jewel Match - Now STILL THE BEST ONE! This is such a great game to play. The ?icons are really CLEAN AND CUTE, the different boards per level challenging and fun, as is building up enough gold to buy EACH NEW powerup. And the BEST PART is looking forward to their FABULOUS SCENES you build up at the end of each level. The Twilight Scenes are MAGICAL, especially with the animations. So I anxiously await every new scene to see what they've come up with. 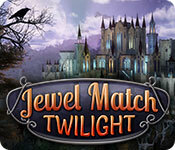 The developers of all these Jewel Match Games (both the Solitaire AND the Match) have done an exceptional job in creating a wonderful, overall experience. I especially LOVE BOTH the TWILIGHTS (Solitaire and Match 3) as well as Jewel Match Solitaire L'Amour, the Jewel Match Solitaire Collector's Edition and the first Jewel Match Royale. A few others are ok, but Naturescapes would have been among my favorites IF they didn't include a few out-of-character sculptures in a few of their scenes. I hope these guys continue to create games with so much imagination that have delighted me so far. THANK YOU GUYS! Rated 5 out of 5 by aricht40 from The scenes are awesome! I purchased this game and am so happy I did. I can't believe how many levels there are! I have never played or bought a game where It actually comes with wallpapers for my desktop. The only down side is that I wish there was a way where I could download the wallpapers to my computer without having the game installed or have the wallpapers disappear when I restart the game. I will be using the wallpapers especially for Halloween! I seriously recommend this game to anyone who loves playing match games. Rated 5 out of 5 by MaryB03 from Beautiful Game, Great Story, Wonderful Music This match 3 game's achievements allow the player to construct eerie structures - there are also bonus mahjong and other games to play. It really gives value for money, it's addictive, and has a great little story line. I wish they would make a Twilight II. Rated 5 out of 5 by pearlmimi from carefull... adictive game !!! Good game,be careful you will be hook ! so fun even if it you do not normally play jewel game. long game also . A must !!! 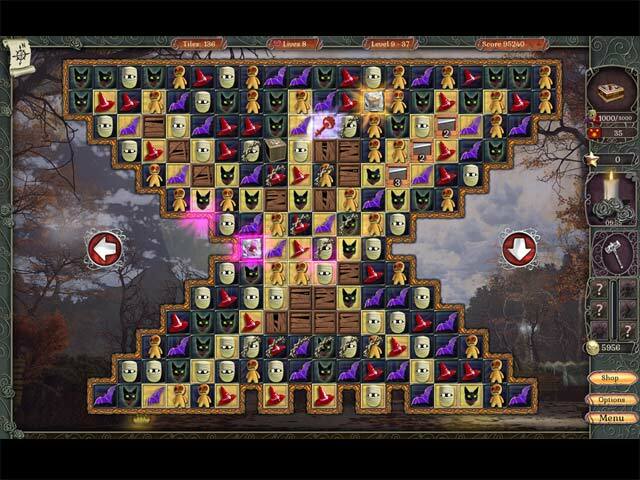 Rated 5 out of 5 by kerith90angel from This is a MUST PLAY match 3 at Halloween! EVERYTHING works in this game; every single thing. THIS IS WHAT I THINK SETS IT ASIDE AND MAKES IT BEST: First thing I should tell you, the tile icons MOVE in this game. It does tend to be distracting so you need to know to go into “options” and there is an adjustable option box to make them stop moving. 1. You have a purpose for matching. There is a scene you collect currency for that you "build" parts into with each level to create a beautiful Halloween scene. 2. This SE offers you WALLPAPERS, even in the demo! As you play additional ones will open. 3. Both the music and the background ambiance is great too. 4. The background scenes are beautiful. The items you match are easy to identify for quick matching due to perfectly clear, computer gen. graphics. I love that this entire game looks less "cartoon like" which can sometimes be too busy in a match 3 game. 5. Shortly into the demo you drop a star to the bottom of the board and it unlocks a bonus area to play that has animation. So much thought and detail went into this game. 6. Bonus games: Side games of Mahjong can be played for additional gold to spend power ups at the in game store can be used to help your progress into further levels. 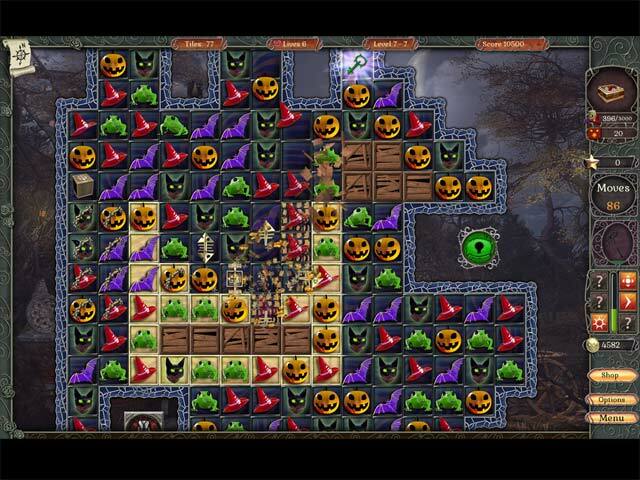 The Mahjong tiles are each decorated for Halloween too, and I’m surprised this isn’t a game to sell all on its own! I highly recommend ALL the other games in the Jewel Match series; they are all a blast. With the holidays & winter coming, be sure to try Jewel Match Snowscapes. There is a link to it within this game and it is equally perfect to this game. This Developer makes you feel like major amounts of time, effort and money went into each perfect game. I'll add the link under favorite games to get to the Holiday Snowscapes Jewel match I think you'll also love. I’VE LISTED MY OTHER FAVORITE HALLOWEEN MATCH 3 GAMES here at BFG: 1. Queen’s Garden: Halloween ~in this M3 you decorate a garden instead. You can change the scene from night to day to watch your little costumed trick or treaters walk the paths of your garden and they stop and look at your decorations. 2. 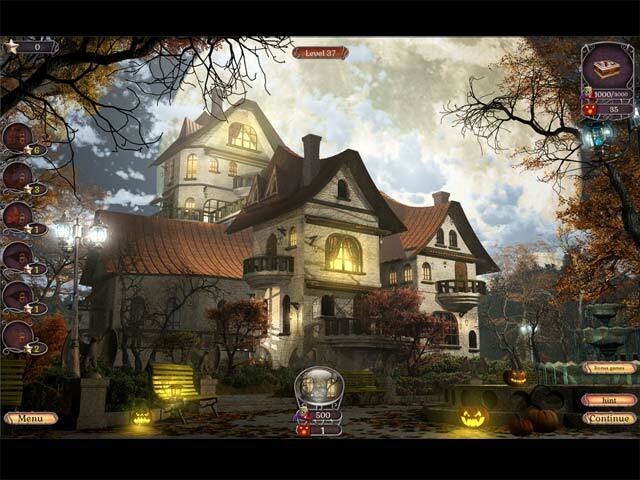 Save Halloween: City of Witches ~A match 3 you decorate a haunted house for Halloween. 3. Spooky Bonus ~Spooky Bonus also gives you wallpapers with the SE! You also decorate a haunted house for Halloween in that game. This game literally sparkles, snaps & pops! Also, if you like Hidden Object games also try this little jewel of a game made in 2013. 4. Shadows: Price of our sins #HOG# Thank you BFG, and the Developers. Please give us more like this! Rated 5 out of 5 by cceepp from Great Game! I just finished playing this game right though, which took awhile, which is good. Everything about this game is awesome. Beautiful art work. Interesting. Works wonderfully. It blows most other games of it's type away. I know that I'll bring it out every Halloween to treat myself.